St Andrews Business Club President Alistair Lang (second left) studies the post-Budget opportunities identified by seminar speakers (from left) Barry Davidson, Stewart Taylor and Matt Strachan from Thorntons Investments. Local business people received expert insight into the post-Budget opportunities for businesses and advice on the latest developments in personal and business financial planning in the penultimate St Andrews Business Club free seminar. The event, titled ‘Post Budget Outcomes: New Rules & Opportunities’, was held at the New St Andrews Golf Club and heard from three speakers from Thorntons Investments. 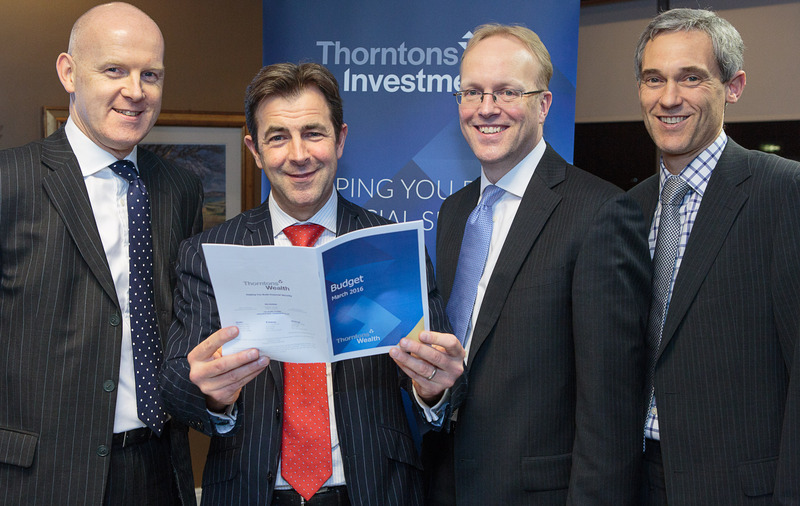 Barry Davidson, Head of Wealth Planning, gave an introduction to Thorntons Investments and its approach to managing clients’ investments before handing over to financial planner Stewart Taylor. He reflected on the outcomes of the Budget and the planning opportunities this and the new pension freedom legislation have created. Finally Chief Investment Officer, Matt Strachan, provided an overview of the current state of the economy and investment markets. The seminar series is supported by Business Gateway Fife and is part of the new drive by the club to increase its membership. The final seminar will take place in April.